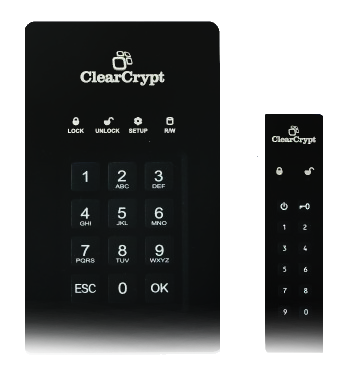 ClearCrypt are an Irish (EU) based company developing encrypted storage solutions for a worldwide audience. The company is a brand of Renaissance Contingency Services, established in 1987 Renaissance has been a long term suppliers of IT Security Solutions. Being in the IT Security sector for over 30 years, Renaissance noticed a gap in the market when it came to encrypted storage devices. ClearCrypt was developed with the limitations of the competition and the needs of the market in mind. Aside from the data loss, reputational damage, customer trust implications and legal issues following a breach will be much more difficult to rectify. In our ever-connected world, an encrypted USB device is not just an accessory but rather a necessity. The ClearCrypt range caters for all your data storage requirements, is flexible and cost-effective. ClearCrypt is top of the game when it comes to hardware encryption with Leading security levels AES 256 as well as being built with USB 3.0, making it some of the fastest products on the market. With Partners in Ireland, UK and Eastern Europe ClearCyrpt is continually growing and expanding. Are you ready for an exciting opportunity?